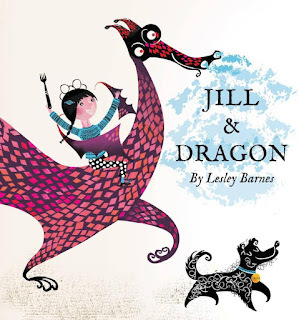 When Jill reads 'and they all lived happily ever after' at the end of her book, she can't help but notice that the dragon in the story looks anything but happy. It turns out that Dragon is so upset that nobody likes him as all he can do is 'burn, scorch, singe, char and barbeque everything in the kingdom'. So, as any compassionate, young girl concerned with animal welfare would do, Jill invites Dragon to come and live with her. At home, Jill shows Dragon her favourite things to do, but they both quickly discover that Dragon is not very good at flower arranging, playing the trumpet or even hosting a tea party. Luckily, Jill is a resourceful soul and she comes up with an excellent way for Dragon to prove himself useful to the kingdom of his story. The next morning, Jill and Dragon charge back into the book and bravely demand to see the King. With his special new skill, Dragon is able to prove he is a valuable creature and the King invites him to come live at the palace. Finally, Jill is able to close the book, seeing as now they truly are ALL living happily ever after. The illustrations seamlessly move from Jill's world to the storybook world, skilfully differentiating between the two by using white space for Jill's world and using a gorgeous parchment effect for Dragon's world. The black and white illustrations washed over with rainbow splashes of bold colours are truly beautiful, exuding an almost Grecian feel. Even the end pages are so gorgeous you'll want to eat them up! An absolute stunner of a book, and if (like me) you want to see more from the talented Lesley Barnes, you can check out her gorgeous website here.